US #91 was issued in 1867 and had the E Grill. But Lincoln was not to see his plans brought to fruition, however, for on April 14, 1865, a bullet from an assassin’s gun abruptly ended the life of one of history’s best-loved men. The American people mourned for him as they had never mourned before, and millions lined the railroad tracks as his body was brought back to its final resting place in Springfield, Illinois. Just about a year after Lincoln’s death, the post office issued its first-ever mourning stamp, and the first to honor Abraham Lincoln. Up until that time, people depicted on US stamps had been dead for several years or even decades. A year was quite quick at the time, which is why the issue is often considered a mourning stamp. That and the fact that it was printed in black, though other stamps before had also been printed in black. US #98 was also issued in 1867 and had the F Grill. 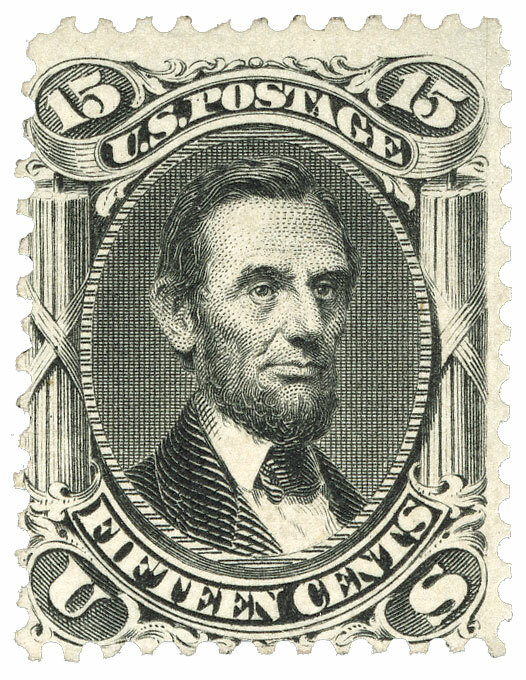 The stamp was based on a photo of Lincoln taken by C.S. German in 1861, shortly before the 16th President was inaugurated. The stamp’s 15¢ denomination likely paid the first class rate to France or Prussia. 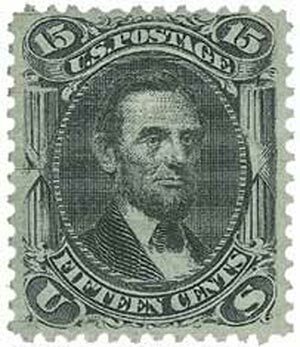 After this stamp was issued, Lincoln would continue to appear in nearly all the regular issue stamp series for decades. 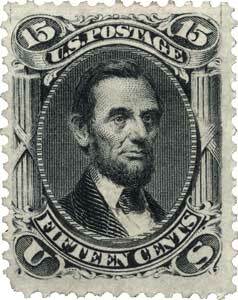 The design of the Lincoln mourning stamp was reused for several years. And in fact, the later stamps are more rare than #77. US #91 is particularly rare, with just about 500,000 issued, compared to over 2.1 million of #77. Both stamps were produced with grills. US #205 – Garfield had only been in office 199 days when he was assassinated. In February 1882, the US issued another mourning stamp. This one honored James A. Garfield, who had been assassinated five months earlier. 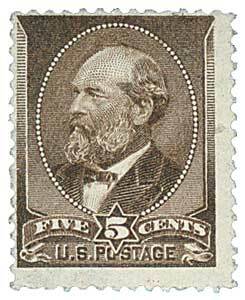 Originally the stamp was to be printed in black, Garfield’s widow didn’t like how the proofs looked and suggested the stamp be printed in brown instead. 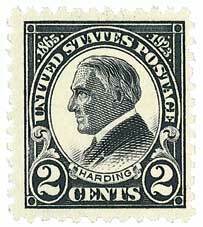 US #610 – 180,000 stamps were sold in Harding’s hometown on the first day of sale. Warren G. Harding was beloved across the country when he died in August 1923, while still in office. An estimated three million mourners gathered to watch his funeral train pass by. The New York Times called it “the most remarkable demonstration in American history of affection, respect, and reverence for the dead.” The post office rushed to produce a stamp, which was designed in a single day and placed on sale a month later. Demand for this stamp was far greater than for any previous special issue. It was impossible to meet the demand by printing from flat plates alone. The Bureau of Engraving and Printing was finally authorized to supplement that printing with a rotary press version. This was the first commemorative or memorial stamp issued using two printing methods. Eventually, over one billion stamps were issued, stretching the original 60-day limit to nearly 6 full months. In 1938, the post office issued the Presidential Series, which honored every president who had died up to that time. Beginning with Franklin Roosevelt in 1945, they started a new practice. Each president would be honored with a commemorative stamp within one year and four days of his death. 2 Responses to "This Day in History… April 14, 1866"
Nice little history lesson! Interesting how they discuss the first presidential mourning stamp, and some successive presidential mourning tamps, but fail to mention the JFK presidential mourning stamp.